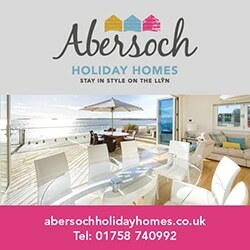 There are certain rituals in Abersoch that mark the turning of the seasons and the coming of the new summer. The Shack, freshly painted, re-opens it’s doors. Every year like clockwork Owi and his team lay the moorings out in the bay – over the coming weeks and months a larger and larger flotilla of boats tie up to their bobbing buoys for the sailing season. On a smaller scale the RNLI volunteers send their little yellow plastic ducks paddling down the River Soch raising funds for local schools and offering great amusement for visitors and locals, young and old. 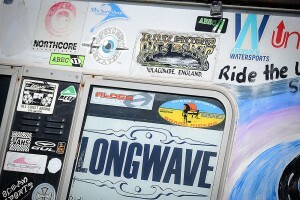 And every year, as full summer heads for the Llyn Peninsula, eagle-eyed viewers will spy a familiar, battered old camper-van winding its way down into the village, through Llanengan and on towards Hells Mouth where, clad in its cloak of vintage surf stickers and skate memorabilia, it will spend yet another long, hazy, happy summer. 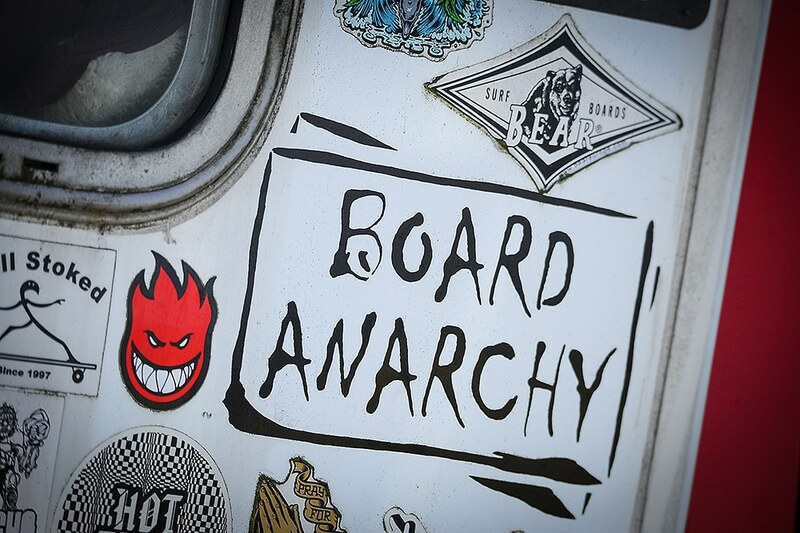 This is the latest incarnation of ‘Old Red’, the camper-van belonging to Abersoch legend and Hell’s Mouth hero Donny Wright, the man behind Still Stoked, the home of stunningly beautiful, handmade, longboard skateboards. When you first catch a glimpse of Donny you don’t necessarily see him – you witness an even more well-known figure. I was having a chat with John Wormald of Totally Abersoch who captured the striking images that accompany this article. He’d been struggling to place who it was that Donny reminded him of. “It’s Willy Nelson,” I said with a smile. And Donny does indeed have more than a hint of that piratical country music ‘auteur’ – a man outside the system with his piercing blue eyes, long hair and bandana. A man in tune with the seasons and who travels to the beat of his own, very different, drum. 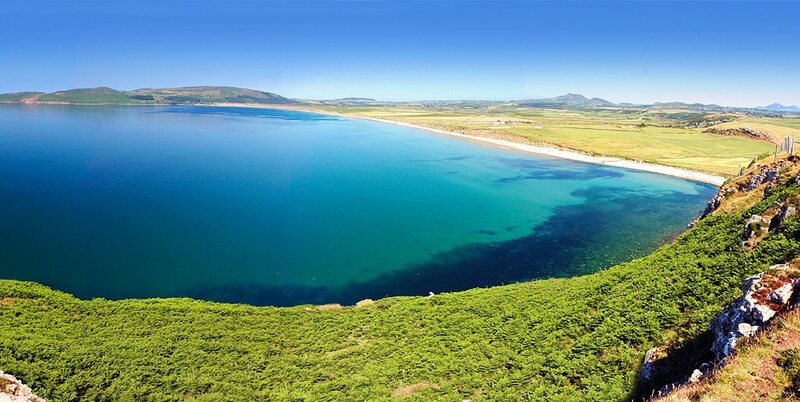 For Donny his Abersoch season is summer . Donny lives a simple life in those hazy dog-days over here in Abersoch, the rack of longboards outside his camper-van ready to be demo’d by the man himself or trialled by passing skaters, a rail of recycled surf clothing bearing the Still Stoked brand wafting in the August breeze and an eclectic collection of smaller items – iconic knitted jellyfish (you have to see them to believe! ), cards and simple jewellery all made by his partner and his young son, who unsurprisingly goes by the name of Ocean. The kettle always brewing, a cup of tea in hand, always happy to talk of the sea and of boards and boarding whether you are buying from him or not, a man with time for everybody. This is a fascinating character, a man who has lived many lives. Those who meet Donny now find a man who is at peace with himself, crafting his lovely longboards in his workshop down in the Forest of Dean then spending the rest of the year travelling the UK surf and skate scene in his camper-van as the worlds lowest pressure skateboard salesman. None of those locations is more important to Donny’s soul than Porth Neigwl. 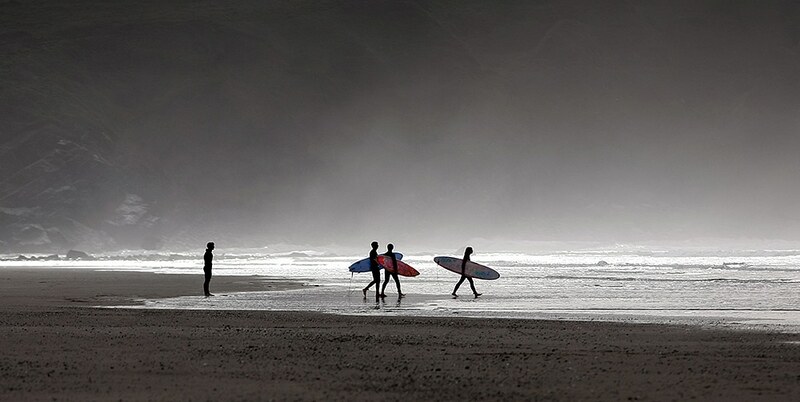 Here as the summer sun rounds Cilan headland and shines its light on Hell’s Mouth bay Donny pitches up with his family, Ocean already riding the boards like a junior pro. So who is Donny Wright? How did he come to be here? What were his other lives? 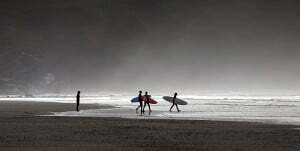 Well the Donny I know right now is a man who surfs beautifully – with the same lazily graceful, laconic style that marks his board-riding on tarmac. When clean waves hit the beach Donny unships his vintage longboard surfboard from the roof of the ‘van, zips up his wetsuit and, that long hair alive in the sea breeze, paddles out to catch the waves in his own distinctive, flowing, heritage style. Donny catches the waves so easily, is so graceful in flight across the face of the wave it is a pleasure just to stand and watch. 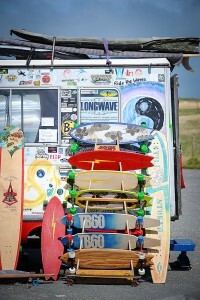 Donny brings the same grace to his land-based longboarding, demonstrating his beautiful wooden creations on the surfers car park and down the gentle slope of the lane from Llanengan. I asked Donny how he would describe himself? “Well to the people who meet me here I’m a ‘Surf-Skate Explorer’ I guess,” said Donny. 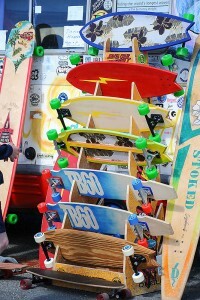 “And the maker of Still Stoked longboards. And that’ll do fine.” But I spend a few hours with Donny one hot Sunday afternoon, holed up on the seat of his charming old camper-van listening to his memories. There is a lifetime of memoirs here, a book waiting to be written. It is said that every cell in the body is replaced every few months. Within those few months we are no longer the same person. Which perhaps explains how Donny has been able to reinvent himself in so many ways, far beyond the crafting of the beautiful longboards you see here – writer, film-maker, river-keeper, fishery consultant, entomologist, fly-tyer, orchard renovator, sportsman, amateur archaeologist, discoverer of Roman Temple remains, alternative lifestyle guru. Donny Wright is also Don Macer-Wright. 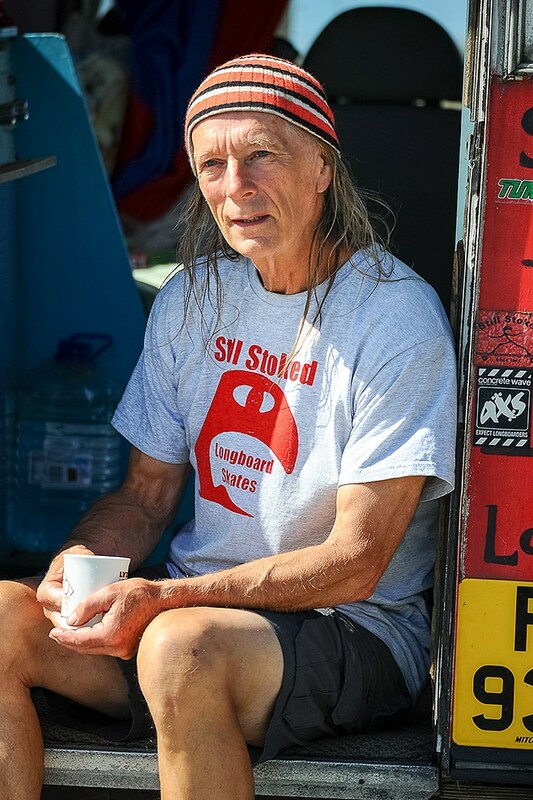 Son of celebrated author on subjects as diverse as fly-fishing and plant cultivation, David Macer Wright, who inevitably planted the love of the water into the man who would become Donny Wright – surfer, skater. But perhaps it was his mother who drove the nature of his life with her laudable maxim, “Donny – you must do what makes you happy”. Which may be why his life came to take a different turn than the Oxford and Sandhurst future mapped out for him. “Shall we agree that I, ‘secured an earlier release than expected’ from my school!” smiles Donny. Instead he turned to a more simple, practical life as a highly respected river-keeper and fishery manager on chalk streams across the south of England and latterly his beloved Wye valley. 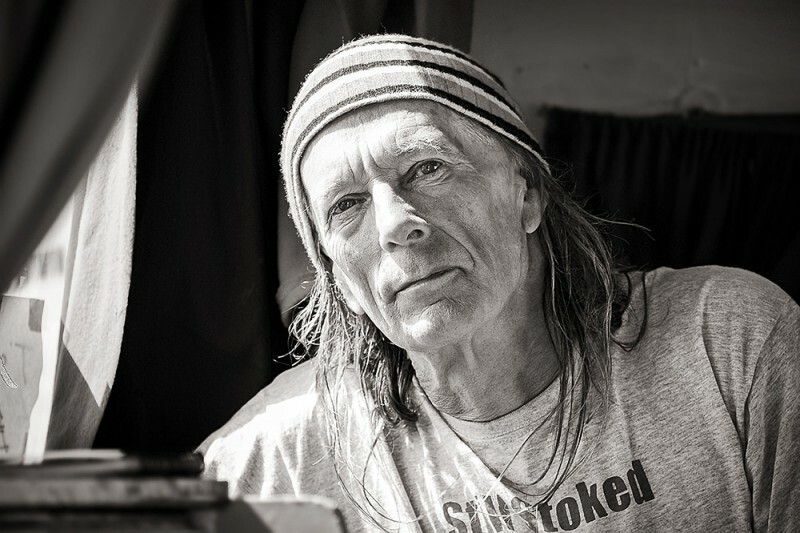 Although now technically a businessman in a number of ways – running a stretch of river, managing the family home of Littledean Hall (along with its freshly discovered Roman Temple remains), as well as Black Dog boards – and father of a growing family, Donny’s life was inextricably drawn to travelling and alternative ways of living – pitching up with the Rainbow Circle and Tipi Valley crews to witness a unique lifestyle that hadn’t entirely died with the Sixties. In amongst the wilder experiences he kept working on his longboards and the mid Nineties saw the development of the iconic Landsurfer board that opened this article. “It was the skateboard for longboard surfers,“ explains Donny. 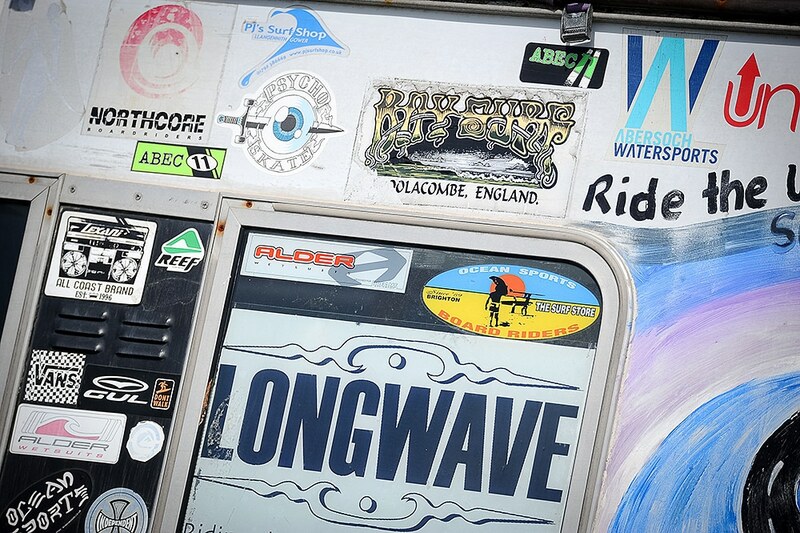 “You popped up like a surfer and rode it like a longboard in classic cruising, dreamy style.” Testimony to the quality of the ride from South Wales surf star Chris “Guts” Griffiths and legendary Santa Cruz surfer Wingnut (yes, that Wingnut of Endless Summer fame!) and Beau Young, son of Australian surf icon Nat Young, drove serious sales of the Landsurfer, not least from what was to become Donny’s summer home of Hell’s Mouth. Black Dog had now given way to Still Stoked. “My older son Tom and his friend Danny Cartwright joined me on a trip to Scarborough, riding Olivers Mount on our longboard skateboards and ‘enjoying’ a bitterly cold, and deeply unsatisfactory surf in mushy, wind-blown winter waves. Drying out in the ‘van in front of the converted Calor Gas bottle wood-burner, Danny looked up at Tom and me and smiled, ‘That surf was a nightmare but thanks to the longboards and the Olivers Mount tarmac, I really don’t care. I’m Still Stoked!’”. That was it, the new name was born. 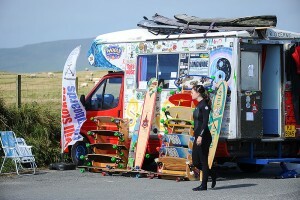 The Abersoch connection was cemented when a number of the surf shops in the village stocked his creations. 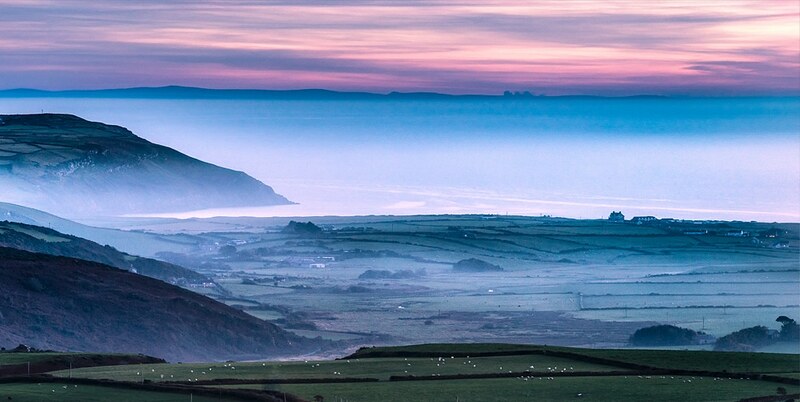 The economics of production means that Donny now sells exclusively from his camper-van, here in the summer at Hell’s Mouth and throughout the year on his travels through Wales and across the UK. These are truly hand-crafted boards – the decks professionally cut and shaped by Nick Jones of Lydwood from Donny’s homeland deep in the Forest of Dean – before Donny adds the best longboard trucks and wheels and applies his distinctive high quality hand-finishing with a range of stains, colour schemes and deck coatings. The results are beautiful – the combination of technical expertise and hand finish producing products that offer as much pride in ownership as they do excellence in riding experience.